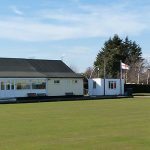 Brandon Town Bowling Club and its facilities were established in 1949, a year after the Remembrance Playing Fields were built on land given to the people of Brandon for the purposes of sports and leisure. The club opened on Saturday 21st May 1949 with the first wood being bowled by Brig. Gen. H G J de Lotbiniere. On the 25th May 2014, Giles de Lotbiniere bowled the first wood to celebrate the 65th anniversary of the club. Every Friday throughout the year a social evening is held in the clubhouse, within which there is a good kitchen and suitable bar to support our bowling and social events. All members have access to the green 7 days a week subject to maintenance/match activities.